The early 1900s were boom years for the American fur trade, and New York City was the fur capital of the world, with more than 230 buyers of raw fur listed in the Peltries Pub. Co. 1918 Fur Buyers Directory. St. Louis was the clear leader in trapping supply houses, with more than 40 such companies open for business that same year. The fur trade was in full swing, and ’most every outdoorsman and farm boy looked forward to trapping season. To capture a bigger share of this lucrative market, trapping supply houses started publishing catalogs with artistically illustrated covers. 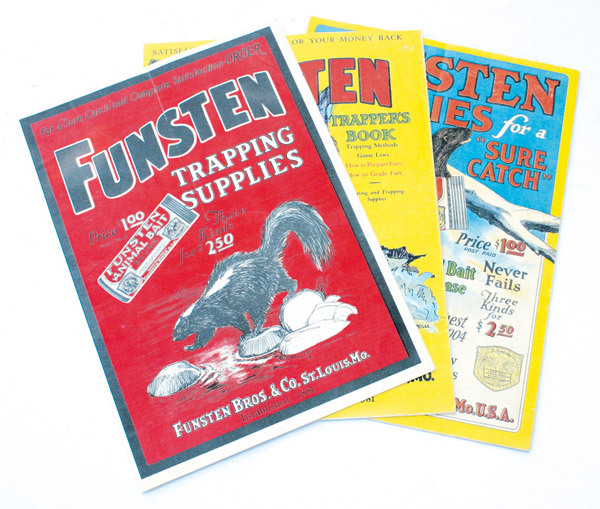 Beginning in 1904, Funsten Bros. & Co. began printing its catalog covers in brilliant color, and it wasn’t long before F.C. Taylor Fur Co., E.A. Stephens & Co., Abraham Fur Co., Herskovits Fur Co., E.W. Biggs & Co., and Hill Bros. Fur Co. jumped on the bandwagon. 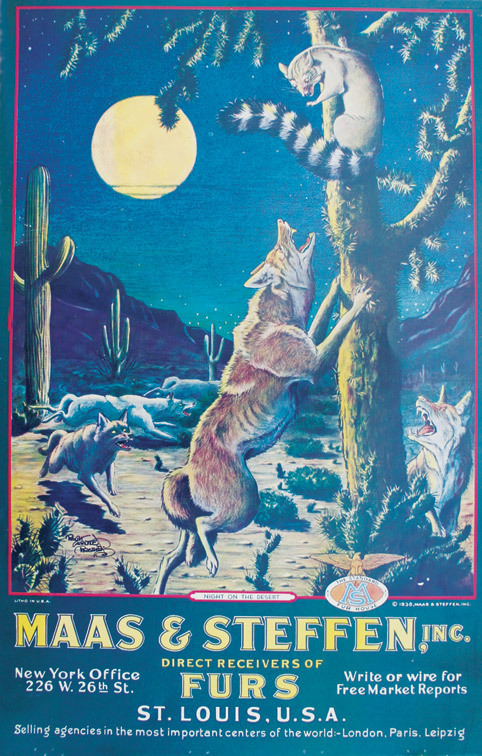 Along with the colorful catalogs, Maas & Steffen, Inc., Hill Bros. Fur Co., Hudson’s Bay Company, Hawbaker & Sons, and a few others also produced decorative calendars that were equally if not more striking in appearance. These colorful collectibles from a bygone era are prized today. Rare supply house catalogs, in fine condition with pages intact and colors bright, may command up to $200. Maas & Steffen calendars (the elite to collectors) were printed from 1925 through 1949. With complete pads and in good condition, the rare ones may bring upwards of $500. During this same time, fur buyers and trapper supply houses also provided shipping tags to make it more convenient for trappers to send bundles of furs to them. Although the tags are not nearly as colorful or valuable as the catalogs and calendars, collector interest is growing. They are worth about $1 each, and there are more than 1,000 known tags to collect. For information on this and other collectible antique traps, contact: Tom Parr, the North American Trap Collectors Association, P.O. Box 94, Galloway, OH 43119; (614) 878-6011.